This conference offers an unique capability to learn about new developments in the field of biomedical imaging, performed by top researchers in the world. These techniques include: optical coherence tomography (line-field and full-field OCT), diffuse correlation spectroscopy, dynamic FF-OCT, wave front shaping and adaptive optics, and cumulative accumulation of single scattering (CASS) microscopy. 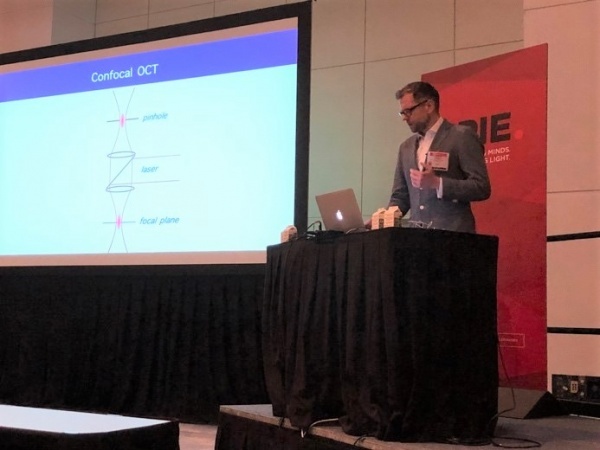 Main goal of Professor M. Wojtkowski visit to the SPIE Photonics West 2019 was participation as the Program Committee Member of the conference: “Optical Coherence Tomography and Coherence Domain Optical Methods in Biomedicine XXIII”, held between Monday - Wednesday 4 - 6 February 2019. • “Full field optical coherence tomography with multiple pinholes”. Apart from the above, Professor was also co-authoring poster “Speckle free full field swept source OCT” presented at the Image processing poster session. Finally, Prof. Wojtkowski have taken part in a meeting of the organizing committee of the ECBO Conference 2019, dedicated to this year’s ECBO conference in Munich. Other members of the team of Prof. Wojtkowski had the opportunity to present his work. Dawid Borycki presented a talk entitled: “Spatiotemporal optical coherence (STOC) manipulation suppresses coherent cross-talk in full-field swept-source optical coherence tomography”. This presentation was a great opportunity to promote the research, performed by the Physical Optics and Biophotonics at the Dept of Physical Chemistry of Biological Systems, Institute of Physical Chemistry, Polish Academy of Sciences. Egidijus Auksorius presented an oral presentation entitled: “Full field optical coherence tomography with multiple pinholes” in “Optical Coherence Tomography and Coherence Domain Optical Methods in Biomedicine XXIII” session. Karol Karnowski give a talk entitled “Imaging of anterior segment pathologies: challenges and future opportunities”. He is also a co-author of other presentations presented at the conference, among others : “Versatile, all-fiber, side viewing imaging probe for applications in catheter-based optical coherence tomography” or “Local optic axis mapping for airway smooth muscle assessment in catheter-based polarization-sensitive optical coherence tomography”.